﻿ I.D. WHAT DOES IT ALL MEAN ? OR WHAT YOU ONCE WERE !!!!!!! number stamped on the passenger side shocker tower when they left the factory. Early Falcon's till 1971 had a dual numbering system. They had a V.I.N. (Vehicle Identification Number ) as well as a body prefix number . The V.I.N. 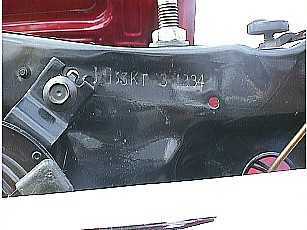 number as stamped on the front edge of the passenger side shocker tower, ( shocker tower and engine are the same remember ) and body prefix and serial number as stamped on the passenger side front of the radiator support panel, which corresponds to the number stamped on the I.D plate fitted to drivers side, till Jan 1970 and the I.D. plate attached to the bulkhead in 1970 only. From Jan. 1971 onwards, Ford went to the 3 way system. Body prefix and serial number as appeared on the I.D. Tag was the same on the engine and shocker tower. 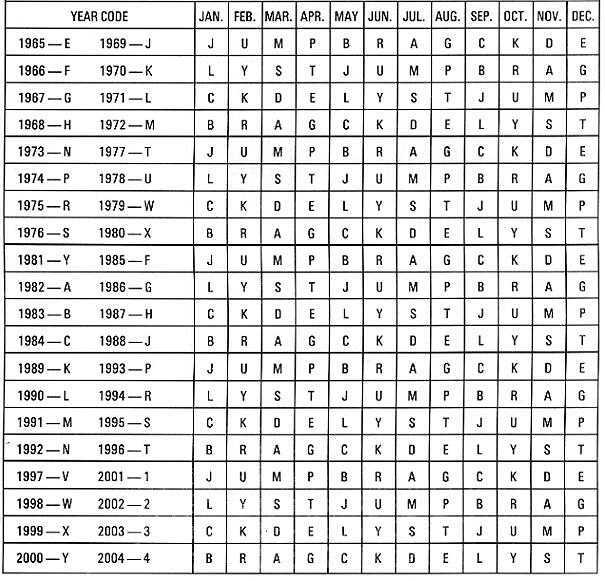 Last letter 'A' stands for the month of production = November, as can be seen in the production date code breaker chart also below. The last five numbers are purely a serial number of the car to specifically identify it. 23 = FALCON 500 SEDAN..
33 = FALCON GT SEDAN. 41 = FALCON 500 UTILITY. 65 = FALCON 500 COUPE..
WHAT DO ALL THOSE NUMBERS AND LETTERS REALLY MEAN ? 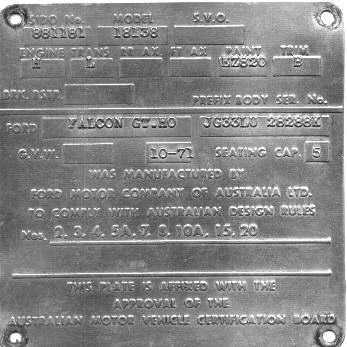 All GT Falcons had a body prefix number starting with JG33 for sedans and JG66 for coupes, unless they were produced in Qld then they would start JH. Haven't seen one yet though. 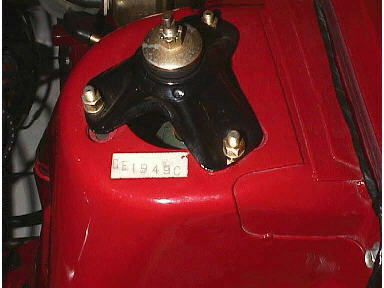 The engine number was stamped on the front of the block behind the alternator. All had " L " for transmission code for four speed manual transmission. All had " U " for trim code for " Charcoal Grey ". C = 170 CID LOW COMP. The engine number was stamped on the front of the block behind the alternator in early examples and on the back of the block behind the intake manifold in subsequent ones . Most had " L " for transmission code for four speed manual or " O " for floor shift auto. XTGT Falcons were offered in 5 standard colours.
" T " = "GT Gold"
" M " = "GT Silver"
" Z " = "Zircon Green"
" G " = "Candy Apple Red"
" E " = "Polar White"
All had " B " for trim code which stood for " Black ". U = 221 CID LOW COMP. Q = 188 CID LOW COMP. The engine number was stamped on the front of the block behind the alternator in all cars. 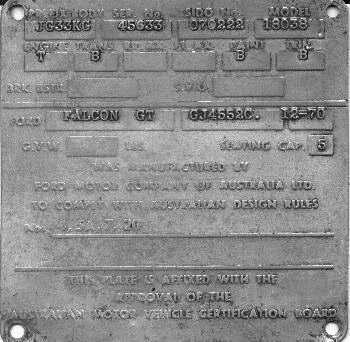 All XWGT Falcons had an engine code of " T " stamped on the I.D. 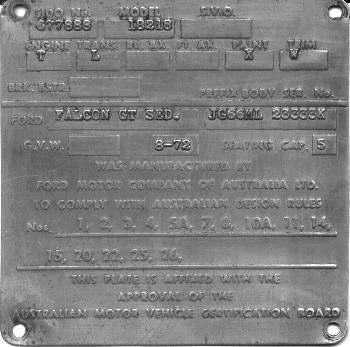 plate which stood for '351 - 4V' Unless it had the ' HO ' option , then it would have an engine code of " H "
Most had " L " for transmission code which stood for four speed manual but if it were optioned with a floor shift auto then the code would be " B "
Not all HO's however had " L " for transmission code as most people think. XWGT Falcons had six standard colours for 1969. Most had " B " for trim code for " Black " and others had " K " for Dark Saddle. Any of these codes followed by a " 2 " meant that they came with a cloth insert option. The engine number was stamped on the front of the block behind the alternator in all cars of this vintage as with the XWGT . This number was also stamped on the passenger shocker tower , parrallel with the fender. 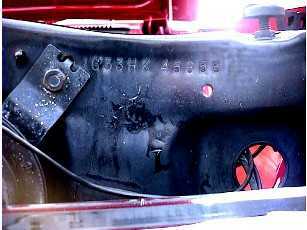 The engine number was stamped on the front of the block above the fuel pump and was stamped as follows. This number was also stamped on the I.D plate. All XYGT Falcons had an engine code of " T " stamped on the I.D. plate which stood for '351 - 4V' Unless it had the ' HO ' option , then it would have an engine code of " H "
Most had " L " for transmission code, for four speed manual but if it were optioned with a floor shift auto then the code would be " B "
All HO's had " L " for transmission code. XYGT Falcon colour range was as follows. Trim colours for XYGT's were " B " for Black, " " S " for Light Saddle and " W " for White. Any of these codes followed by a " 2 " meant that they came with a cloth insert option. J = 250 LOW COMP. E = 200 LOW COMP. All XAGT and XBGT Falcons had an engine code of " T " stamped on the I.D. plate which stood for '351 - 4V' Unless it had the ' HO ' option , then it would have an engine code of " H "- Never Seen One Though. Colour range for these cars was substantial. The following list are the popular colours only but you could get any colour you wanted really. Trim colours for XA's were " B " for Black, " " S " for Saddle " W " for White "A " for Blue " P " for Parchment " U " for Dark Grey and " Y " for Burgundy. Any of these codes followed by a " 2 " meant that they came with a cloth insert option. Trim colours for XB's were " B " for Black, " " S " for Saddle " W " for White " P " for Parchment " C " for Chamois and " K " for Brown. Any of these codes followed by a " 2 " meant that they came with a cloth insert option. DON'T TELL ME YOU'RE STILL ENJOYING YOURSELF !!! Typing errors were not uncommon but seemed to increase by this stage. Note that both these tags are for Coupe's but the description says " SED "